Our Clearly Amish© American Mission Media Collection features classic Side Korbels and clean, straight lines inspired by the Original Arts & Crafts movement. Each piece is Bench Built with hand selected 5/4 Quartersawn Oak or Cherry, English Dovetail Cedar Drawers, Mortised and Tenon joinery, Traditional Oxidized Iron Hardware, plus classic straight sides that reflect it's dedication to purpose, It's Mission so to speak. Attention to detail and dedication to the highest standards, results in Heirloom Quality Furniture that will last for generations. Each piece is available in any configuration to suit all your storage and media needs. Our Clearly Amish© Aurora Media Collection was inspired by the Crofters of Scotland and the Roycrofters of the U.S. Notice the Classic Side Korbels, Canted sides, subtle curves. Every piece is "Bench Built" and hand crafted for exacting quality. We use hand selected, old growth, 5/4 Quartersawn Oak and Cherry wood from renewable sources. Each item uses Mortise and Tenon construction, Solid Dovetail Cedar Drawers, Wooden Drawer Glides, and hand applied finishes with a conversion varnish, the most durable finish available. A perfect addition to your home and Heirloom Quality for generations to come. Each piece is available in any configuration to suit all your storage and media needs. Our Clearly Amish© San Marino Media Collection was inspired by the California Arts & Crafts movement centered in the Pasadena, San Gabriel valley . Notice the unique subtle curvatures, Hammered Iron Hardware and Dark Oak end grain accents on the bottom panels. Every piece is "Bench Built" and hand crafted for exacting quality. We use hand selected, old growth, 5/4 Quartersawn Oak or Cherry wood from renewable sources. Each item uses Mortise and Tenon construction, Solid Dovetail Cedar Drawers, Wooden Drawer Glides, and hand applied finishes with a conversion varnish, the most durable finish available. A perfect addition to your Living Room and Heirloom Quality that will last for generations. Each piece is available in any configuration to suit all your storage and media needs. 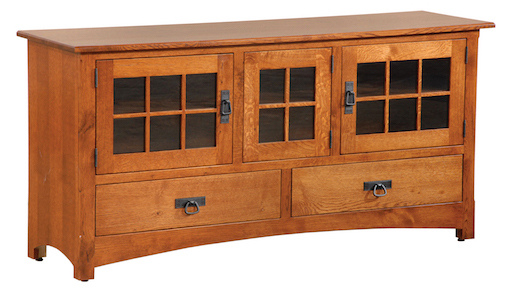 Our Clearly Amish© Series would like to present The Craftsman Collection of Media Furniture. Inspired by the Craftsman movement born of the Midwest, each piece exemplifies Craftmanship and attention to detail rarely seen in this day and age. Notice the Post constuction, Antique Copper Hardware and a Truly Unique inlay made from Ebony, Maple,White Oak and Dark Oak which all converge to create a classic Craftsman Signature Inlay. Every piece is "Bench Built" and hand crafted for exacting quality. We use hand selected, old growth, 5/4 Quartersawn Oak or Cherry wood from renewable sources. Each item uses Mortise and Tenon construction, Solid Dovetail Cedar Drawers, Wooden Drawer Glides, and hand applied finishes with a conversion varnish, the most durable finish available. A perfect addition to your Living Room. Each piece is available in any configuration to suit all your storage and media needs.